Born on September 26, 1898, in Brooklyn, New York, George Gershwin dropped out of school and began playing piano professionally at age 15. Within a few years, he was one of the most sought after musicians in America. A composer of jazz, opera, and popular songs for stage and screen, many of his works are now standards. Gershwin died immediately following brain surgery on July 11, 1937, at the age 38. Throughout his 23-year career, Gerswhin would continually seek to expand the breadth of his influences, studying under an incredibly disparate array of teachers, including Henry Cowell, Wallingford Riegger, Edward Kilenyi, and Joseph Schillinger. From 1920 to 1924, Gershwin composed for an annual production put on by George White. After a show titled Blue Monday, the bandleader in the pit, Paul Whiteman, asked Gershwin to create a jazz number that would heighten the genre’s respectability. 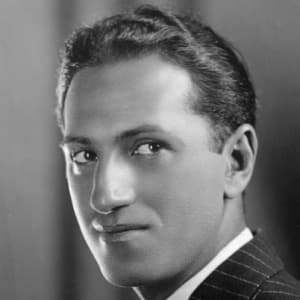 During this time, and in the years that followed, Gershwin wrote numerous songs for stage and screen that quickly became standards, including “Oh, Lady Be Good!” “Someone to Watch over Me,” “Strike Up the Band,” “Embraceable You,” “Let’s Call the Whole Thing Off,” and “They Can’t Take That Away from Me.” His lyricist for nearly all of these tunes was his older brother, Ira, whose witty lyrics and inventive wordplay received nearly as much acclaim as George’s compositions. In 1935, a decade after composing “Rhapsody in Blue,” Gershwin debuted his most ambitious composition, Porgy and Bess. The composition, which was based on the novel Porgy by Dubose Heyward, drew from both popular and classical influences. Gershwin called it his “folk opera,” and it is considered to not only be Gershwin’s most complex and best-known works, but also among the most important American musical compositions of the 20th century. Following his success with Porgy and Bess, Gershwin moved to Hollywood and was hired to compose the music for a film titled Shall We Dance, starring Fred Astaire and Ginger Rogers. It was while working on a follow-up film with Astaire that Gershwin’s life would come to an abrupt end.